The first issue of People's Magazine made its debut in July 1906, and featured 192 pages of assorted fiction, articles, and poems. 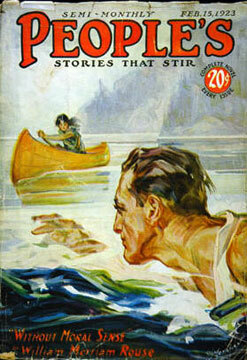 Published by Street & Smith, People's was intended as a companion to The Popular Magazine, and showed an early emphasis on detective fiction rather than straight adventure. People’s was edited for several years by Archibald Lowery Sessions, and followed the style of including long installments in its serials, so that each installment was of itself a practically complete story. When John W. Harding became editor in 1909, this practice was continued. The magazine originally contained both old and new material. In its first few months of publication, it reprinted poems, articles, and short stories by a number of famous names, including John Milton, John Keats, Charles Lamb, Henry Ward Beecher, and Oliver Wendell Holmes. Contributors of new copyrighted material were not in short supply, however, and in November 1906, the magazine’s editor announced that People’s would no longer include reprinted fiction and poetry. 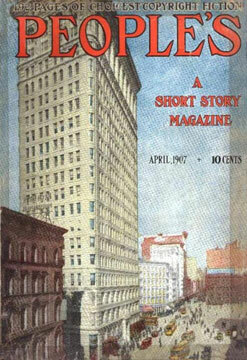 From its December issue, the magazine carried only original, copyrighted matter rather than a combination of reprints and new fiction and articles. In May 1914, John Buchan wrote to his publishing partner, George Brown: 'I have picked up two detective stories out of an American magazine, which seem to me rather a new species'. The stories were by Clinton H. Stagg, and featured the blind detective, Thornley Colton, who used modern 'scientific' methods to solve otherwise hopelessly elaborate crimes. Stagg's 'new species' of detective stories had appeared in People’s from February to October 1913. In June 1915, the first installment of Buchan's own 'new species' of detective story, The Thirty-Nine Steps, would appear in Frank Munsey's All-Story Weekly. Other notable contributors over the years included Albert Paysun Terhune, Ellis Parker Butler, Eden Phillpotts, Alfred Damon Runyon, and H. Bedford-Jones. 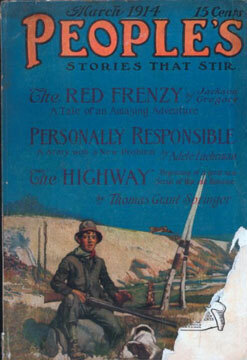 People's Magazine survived, across several slight title changes, for 279 issues before finally folding in 1924. Inge, M. Thomas, and Dennis Hall. The Greenwood Guide to American Popular Culture, Volume 3. Westport, CT: Greenwood Press, 2002. "Letters between John Buchan and George Brown", 8 May 1914 and 20 May 1914, Gen 1728, B/5/1914, TN/EUSC. Macdonald, Kate. "John Buchan's breakthrough: The conjunction of experience, markets and forms that made The Thirty-Nine Steps". Unpublished essay.